This might be the best fruit-based salsa I've ever tasted. It's definitely my favorite Archer Farms salsa so far. And I really enjoyed some of their other salsas, particularly the mango peach and black bean roasted pepper. The main thing that sets this one apart from the other salsas is the fact that it truly is "medium" on the spice-o-meter, at least in my humble opinion. While the mango peach salsa was labeled "medium," it definitely fell short of the mark in the heat department. 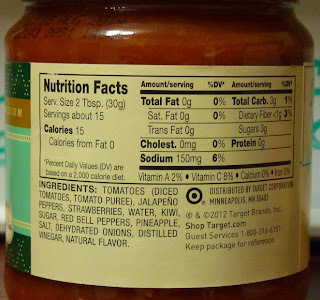 Not only is this salsa moderately hot, but the heat doesn't get in the way of the fresh, sweet "summer fruit" flavors they threw into the mix, including strawberry, kiwi, and pineapple. And I guess technically tomatoes are fruit, too, but they're filed under "vegetables" in my brain. There are also chunks of jalapeno and bell peppers in the jar, and they all blend together better than I would have ever imagined. I tried this sauce on some salt and lime chips, and it was brilliant. The lime enhanced the fruitiness of the salsa, yet the chip flavor was subtle enough to allow the salsa flavors to shine through like the summer sun. I'm still on a quest to find that perfect Archer Farms food. The one that will get our first 10 star score. And while this comes darn close, earning our first 9 star score in the condiment category, it's not quite perfect. 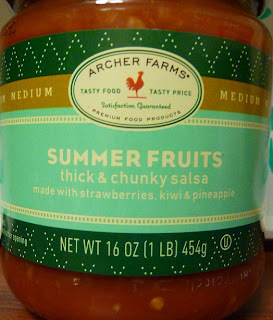 I would like to see a salsa that's truly "hot" and sweet, and the chunks of fruit could be just a tad larger. That's nitpicking, I know, but I'm a tough grader. has anyone seen it for summer 2014 yet? I love this stuff!